The following is part of a thread from collectSPACE. 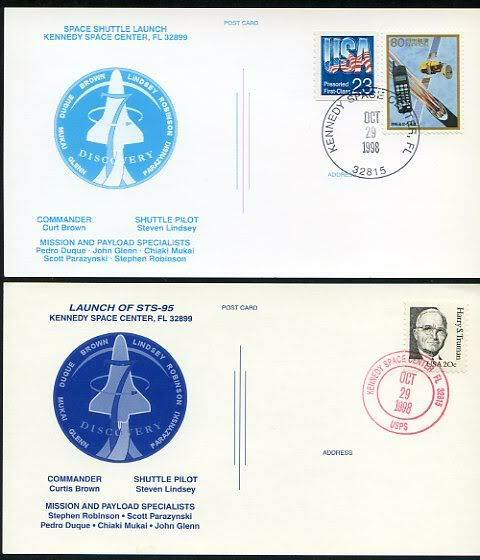 randyc: I noticed a couple of 'VIP' type cards for the launch of STS-1 on eBay. I thought that the last official NASA VIP card was for the launch of the Skylab Orbital Workshop (OWS) on May 14, 1973 and any 'VIP' type cards produced after that were made by dealers or other individuals, but not NASA. Is that correct, or are there Official NASA VIP cards for missions launched after the Skylab OWS? Apollo-Soyuz: The last VIP card was actually for Skylab-2 the first manned Skylab flight. There was a special VIP card for STS-95 the return to orbit of John Glenn. eurospace: Private dealers (I think of Rand Philately at Houston [Webmaster: this is incorrect. They were produced by a German dealer Carstan Fuchs and probably sold by Rand Philately - see later in thread] ) have produced cards similar to the VIP card design until the latest missions. Bob M: John mentioned about a special VIP card issued for Glenn's STS-95 flight. Below are two that I obtained, but I don't know their origin or if they are actually official NASA/KSC VIP cards or just privately produced ones. At first glance, they appear identical except for one being a much darker blue. However, the wording at both the top and bottom are different. I suspect that the bottom card is the official NASA/KSC VIP card, while the top card is privately produced - perhaps by German space dealer Carstan Fuchs. Ken Havekotte: To help set the record straight, there were official VIP cards produced for STS-95 that my company, SpaceCoast Cover Service (SCCS), arranged. In Sept. 1998, NASA and DNPS, approved an "official VIP card" production use. About 10,000 of them were produced by SCCS under official NASA-DNPS contract. About 6,000 of them were delivered to DNPS/KSCVC for distribution at the main VIP launch viewing sites. About 1,000 more of them were delivered to the shuttle press site for news media distribution on Discovery's Oct. 29th launch day. Of the additional 3,000 or so left over, DNPS ordered another 1,000 or more (which is another story to tell) with the remainder of the cards in my possession. Just about all so-called VIP cards produced after NASA's last VIP card issue for SL-2 in May 1973 were privately printed by space cover dealer Carsten Fuchs of Germany. His cards, which includes all shuttle flights from STS-1 to present, are in no way of any "official" status. His cards can be identified with light-blue ink markings and usually on a heavier-card stock. The "official" cards for Glenn's return to flight were printed in a darker blue (see Bob's second card image-scan for STS-95).